Congratulations - you've learned some boxing skills. You're confident and feeling indestructible and now you think you're ready to climb into the ring to see how you do against a real-life opponent. If you think you are ready to spar - your next step is not to get in the ring - it's to go find a coach. No joke - sparring should not be undertaken without qualified supervision. Boxing sparring - even between friends - is combat. Tempers can and do flare and things can get out of hand pretty quickly. 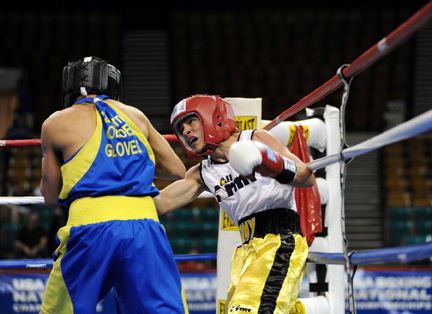 Boxing sparring is an essential component of your development as a boxer. Even if you are never planning on competing - sparring adds a whole new dimension to your boxing training - keeping it fresh and exciting. Done right - climbing into the ring and sparring with an opponent is an enjoyable and addictive experience. Done wrong - and it destroys confidence and can drive once-eager new boxers away from the sport forever. So when you have a coach and you're ready to introduce sparring into your training regime - here are some guidelines - the do's and don'ts of sparring. There are three types of sparring - and each has its specific use in developing a boxer. The first two are types of situational sparring meaning the focus is on what you do when a certain situation presents itself in the boxing match. The situation could be anything - one boxer has another on the ropes, in the corner, toe-to-toe in the middle of the ring - it doesn't matter - but the goal of the sparring session is to condition responses to specific situations the boxer may find him or herself in. At the bell - the boxers go through the scenario and once the boxers perform the necessary actions to be successful in the situation - the situation is reset and then it plays out again - to drill the reaction until it becomes instinctual. Technical Sparring -is sparring with the intent to perfect a specific drill or movement. It's not done as much to develop the boxers ability to think in a combat situation as it is done to perfect the execution of drills and response to a particular situation. Technical sparring is very specific and limited to the skill being developed. For instance - you may be learning how to get off the ropes. You will start the sparring session back against the ropes with your opponent in front of you ready to throw punches. On the go - you will perform the specific steps required to step outside and spin your opponent into the ropes while defending against the incoming punches. Once you perform the technique successfully you will stop, the situation will be set up again, and you will repeat - and you will do this over and over until you don't have to think about it anymore. Conditional Sparring - is the second type of situational sparring. Conditional sparring places limits on what can and cannot be done before the sparring session begins. Unlike technical sparring that restricts flexibility (the movements are performed in a specific way each time) - conditional sparring does not remove the boxer's freedom to adapt to what is going on. For that reason - this type of sparring is very useful in allowing the boxer to take skills that have been developed during technical sparring and use them in a manner that fits into their boxing style as they adapt to situations in the ring. For instance - if the intent of the session is to perfect slipping a jab, the fighters may agree to only throw at half speed and that only one of them will throw the jab while the other slips or that they alternate throws, and so on. Other than that - they are free to move around and react in whatever manner suits their style of fighting. All Out Sparring - is sparring without limitations or conditions. The boxers are doing what they would do if they were competing. It is no different than a boxing match except that the coach is acting as the official and will stop/start the session as required providing feedback to the boxers throughout which is not allowed in a regular boxing match. Honestly - there isn't a whole lot of reason to do this very often until a boxer is in the work-up stages of pre-contest development. It is effective for giving the boxers a sense of what will feel like to be in a fight and gives them a chance to identify and work out ways of dealing with the effects of combat stress - but only if the trainer and coaches maintain control of the sparring and ensure that feedback and coping strategies are given. Coaches have to be careful about when and how all-out sparring is integrated into a boxer's development and watch closely to how their boxer reacts in the ring. All-out sparring can invigorate or it can destroy. I've seen boxers train for months, get in the ring to spar, and then disappear forever because they feel inadequate at the end of it. In most cases the coach could have kept that boxer around just by providing some encouragement or understanding of what they just went through. I'm not saying that coaches need to be all touchy/feely but acknowledging a kid's reaction and re-framing his or her perspective of what just happened can turn what they may perceive as a failure into understanding that it is a normal step on the road to becoming the best boxer possible. I guarantee more new boxers would stick with the sport if trainers would stop shunning those who don't perform on their first go in the ring. All-out sparring for newer boxers has limited utility. It is generally not effective for learning new skills or trying out new things because the boxers are totally absorbed by the combat experience. At best, the boxers will instinctively fall back on whatever has been drilled into them to this point. At worst - the new boxer will freeze completely. An adequate amount of technical and conditional sparring is a must so the new boxers can gain more experience and confidence in the ring. Eventually they will be able to maintain some ability to think and strategize - but it takes time and patience and does not happen until the boxer can control the effects of combat stress. Plus, the risk of injury is magnified substantially - use it sparingly. Overall - how often an amateur boxer should spar depends on a variety of factors including the short and long-term goals of the boxer, where the athlete is in the overall athletic development cycle, and the learning style of the boxer. Some boxers will learn skills much quicker when faced with an opponent. Others are better at visualizing an opponent and develop just as quickly with fewer sparring sessions. Technical sparring should be introduced into the training regime when boxers have achieved understanding and demonstrate proficiency with the fundamentals. Boxers require a minimum level of body coordination and technique to ensure the sparring session remains technical and safe. The purpose of technical sparring should be clearly articulated so that both boxers understand its utility and the purpose for that particular session. Start with one skill or movement and then daisy chain them together into flow patterns (chain drills). The manner in which the trainer introduces boxing skills and techniques will generally dictate the frequency with which technical sparring should be undertaken, but there is absolutely no problem with putting a technical sparring session1 (properly supervised) into every practice to drill a certain skill or movement learned that day. It can also be done en masse (i.e., delivered in a group setting) without issue. Conditional sparring requires the full attention and supervision of the trainer. Even if a limit of half-speed is imposed - the sparring session can quickly escalate to all-out sparring if the trainer loses control of what is happening in the ring. Conditional sparring is the next natural progression from technical sparring therefore its frequency depends on what is learned prior and also how quickly the boxer assimilates the new skills. As an example, I like to use technical sparring to develop skills and movements throughout the week that culminate in a weekly conditional sparring session where boxers are given more freedom to use what they've learned to that point. All-out sparring should be limited to the later stages of pre-contest development and never introduced until the boxer has the skills necessary to defend him or herself. No matter what we think as trainers - unless someone has the desire to get in the ring - there is no reason to subject them to full combat. Even then the coach should make sure that the sparring sessions build up the confidence of the boxer - becoming more frequent up to a point in the lead-up to a fight. At that point (a few days before the fight), there should be no all-out sparring to ensure the boxer is free of any injury and is ready to go on the day of the fight. With technical and conditional sparring - there is benefit to mixing up the skill and weight classes of the boxers. Boxers become better boxers when challenged or pushed to perform at a higher level. Technical and conditional sparring with someone of a higher caliber or who naturally possesses more power or speed because of their weight class or are taller/shorter is just good training. All out sparring is different and has a way higher potential for injury - both mental and physical. We're not training street-fighters who could encounter any size opponent at any time. For that reason - mimic the boxing match by ensuring your boxer spars with someone of comparable experience and weight. It is ok to pit them against someone with better technical skill and that is encouraged - but someone with a set level of skill will find it difficult to overcome more experienced and heavier/lighter opponents. I'm talking about relatively new boxers here. At some point a boxer's technical skills and level of experience are so sound that they can often offset any advantage offered by a higher or lower weight class. Sparring is no different than imparting any other skill. Start slowly and build up speed gradually. Pair offense and defense and focus on techniques that complement and flow naturally from one another. Let the boxers develop their own unique style while staying technically pure. Let them mix it up and experiment. The more weapons they can develop, the more adaptable they become. So your coach is ready to put you into the ring. It's time to put the drills and skills learned on the heavy bag or in front of the mirror outside of the ring to use. Review the effects of combat stress - Become comfortable with techniques to minimize their effects. You won't ever eliminate combat stress completely, but you can manage its effects so you can still function. Relax - Relax between bursts of energy to conserve energy for the next burst of energy. Tensing up will slow you down and will burn you out long before the sparring session is over. Prepare to get hit - All out sparring is fighting. Even with technical and conditional sparring - it can be hard and fast. Situational sparring has an element of control but you are now dealing with another intelligent human being and there is no avoiding getting hit at some point. Learn how to deal with getting hit and maintain control of yourself. Instead of turning into a raging lunatic or turtling - remain focused, calm and calculative. Use what you've learned to strike back and do not spar out of anger. Protect yourself - Make sure you wear all the protective gear I describe in the boxing gear guide on Commando Boxing. Keep perspective - Your coach will try to keep things under control, but remember you are sparring to learn - not kill the other guy or gal who is also there to learn - so don't go in swinging wildly and forgetting everything you've spent months training on. Keep your composure and box - don't street-fight. Record the sparring session - When starting out - you'll be so focused on surviving that you won't even remember what you did let alone what the coach is telling you to do. Try and record the sparring session to review with your coach afterwards when you can actually focus on finding your mistakes and then work like hell to correct your bad habits. Have fun - You're finally getting to use what you've been working so hard to perfect over the last few months. Enjoy the sensations of combat. Your development from here on in will be a function of your desire to perfect what you've already learned and integrate new techniques into your boxing style. Any chance you get, review your sparring sessions. This is where a good coach comes in. Any coach worth the good money you pay them will polish you off and get you ready for your first big bout. Good luck, and feel free to share your successes and failures with us - just leave a comment.